Prove to the Barbarians of Rellekka that you are worthy of being welcomed into their tight-knit clan! 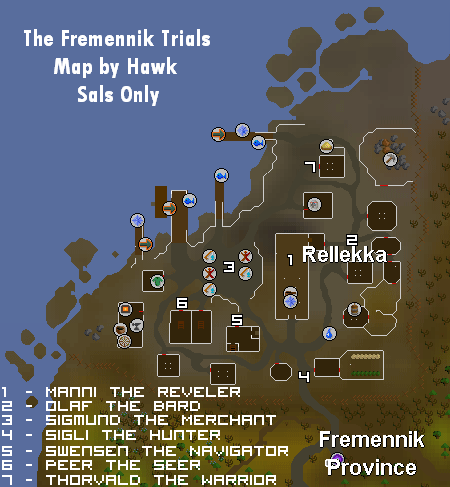 If you are looking for the modern RuneScape guide for this content, please see our The Fremennik Trials guide. Council workers have at last found time to make repairs to the footbridge that connects Kandarin with the barbarian town of Rellekka. Do you have what it takes to impress the barbarians who live there and perhaps be welcomed as an honorary member of their clan? Begin by asking Brundt the Chieftain in the village of Rellekka for a quest. Firstly, talk to Brundt the Chieftain in the village of Rellekka for a quest. To get to the village, head over the bridge to the southwest of Sinclair Mansion and follow along the road. Brundt is in the pub, and when you ask him about a quest he says that he has something for you. Tell him that you're interested, and he says that in order to joint the clan, you need approval from 7 members of the council. Talk to Manni the Reveller in the pub, and he will challenge you to a drinking contest. Say yes, take a Keg from the north table and talk to Manni again. You'll lose the contest, and it seems that you'll have to trick him. Take a beer off of a table, and then head to the Seers' Village to find the Poison Salesman in the pub. Talk to him about the trials and buy a Low Alcohol Keg for 250gp. Now head back towards Rellekka until you reach the Council Workman. Use the Beer on him and he'll give you a Strange Object. Warning: the Strange Object will explode, so don't light it unless you're near the pub! Go back to the Rellekka Pub, and use a tinderbox with the object to light it. Now use it on the Pipe on the east wall of the pub, and then take another keg from a table inside. Use it with the Low Alcohol Keg to mix them, and then talk with Manni again to have another contest, which you'll win. You can find Olaf to Bard to the east of the pub, and he'll ask you to perform for a crowd for his vote. After talking to him about how to perform and how to make a Lyre, leave town and follow the east path until you see a Rare Tree symbol on your map. Cut a branch from the Swaying Tree, and then use your knife with it to cut it into an Unstrung Lyre. Tip: If you don't meet the Crafting and Fletching requirements, you can kill Lanzig who is level 48 and located in the southeast corner of Rellekka to get the Lyre. It is a rare drop, but it's a quicker method of getting the lyre if you don't meet the skill requirements. Now head southeast and talk to Lalli about another man that came by, head back to the pub and talk to Askeladden outside. He gives you a Pet Rock, and then pick an onion, potato and cabbage from the garden to the southeast. Go back to Lalli, and then put the rock and veggies into the stew, talk to him and then he'll give you some Golden Fleece. Use this with a Spinning Wheel to get Golden Wool, and then use it on the Lyre. the nearest usable one can be found in the Seer's Village, as you are unable to use the Spinning Wheel in the Fremennik Village yet. Go to the bridge you cross to get to the Fremennik Provence. Head West until you come to a place with a piece of land sticking out to the South. At the Southern tip of this bit of land sticking out is the place that you enchant the Lyre. Go back to the pub and go into the room in the northeast corner to get on stage and play the lyre. The Sailor - he's to the northwest, and he needs a ballad written. The Bard - he wants some new boots to write the ballad. Yrsa - she owns the clothing shop southwest of the sailor, and she wants taxes reduced in exchange for the boots. Brundt - he wants the tribe to know of Sigli's hunting grounds. Sigli - he's just south of the pub, and he needs a balanced bowstring. Skulgrimen - he is in the building to the north of the pub, and wants a rare fish. Fisherman - he is to the northwest, and he wants a secret map of the best fishing spots. Swensen - he can be found just south of the market, and he wants a weather forecast. Peer - he's a short distance northwest, and he needs a bodyguard. Thorvald - he is in the building north of the pub, and he wants a place at the Champion's Table. Manni - he wants the Barkeep's legendary cocktail. Thora - she wants Askeladden to sign a contract to stay out of the pub. Askeladden - he will sign a contract for 5,000gp. Once you have the contract, head back to each of the people: Thora, Manni, Thorvald, Peer, Swensen, the fisherman, Skulgrimen, Sigli, Brundt, Yrsa, the Bard, the Sailor, and then back to the Merchant. Sigli the Huntsman is just south of the pub, and he wants you to kill the level 69 Draugen. He'll give you a Hunter's Talisman when you accept. Leave the village and click 'Locate' on your talisman, wandering around in the direction it points to until it appears. After killing it, go back to Sigli. You can find Swensen the Navigator to the south of the market place, and he says that if you can get from 1 side of his maze to the other he'll vote for you. Go down the ladder in the southwest corner, and then go through the portals in the specific directions to spell his name: south, west, east, north, south, east, and north. Go up the ladder to complete his trial. Peer the Seer is just southwest of the market, and he wants you to solve the puzzle in his house for his vote. First, try and open the door and read the riddle. Since each person gets a different riddle, you need to figure it out on your own, but they are relatively simple. Each line give you 2 different words, each with a letter in them, which you will need to spell out a word, depending on what the riddle says. Now go through the door and up the ladder. Note: Possible answers to this riddle include "fire", "life", "mage", "mind", "time", "tree", and "wind". Search the cupboard in the southwest corner for a bucket, and fill it with water from the tap next to the drain. Get another bucket from the cupboard, and empty the first 1 down the drain. Search the chest on the south wall for a jug, fill it with water and take another. Use the jug with 1 of the buckets for 3/5ths of a bucket, and then use another jug of water with the bucket to fill it, and be left with 1/3rds full jug. Use the 1/3rds full jug with an empty bucket, and then use another full jug with the bucket to get 4/5ths full bucket. Use this on the chest to the north to get a Vase. Now study the Unicorn's Head for a Red Disk, and the Bull's Head for a wooden 1. Search the bookcase to find a Red Herring, which you can cook on the range to get Sticky Red Goop. Use the goop on the Wooden Disk to get a Red Disk, go down the east ladder and use the disks on the Abstract Mural to get a Vase Lid. Fill the Vase with water from the upstairs tap, put the lid on it, and use it with the Frozen Table in the northeast corner to get a Frozen Key . Now just use the Frozen Key with the range to get a Seer's Key, which can be used to unlock the door downstairs in the mural room to finish. You can find Thorvald the Warrior in the building north of the pub, and he wants you to fight against a warrior called 'Koschei the Deathless' to win his vote. You can't wear any armor or weapons, but it's a good idea to bring Monk Robes, and an Amulet, as well as food and a Prayer Potion or 2 if you have at least level 43 Prayer. Head down the ladder and wander around until Koschei the Deathless appears, and attack him. You only need to defeat the first 3 forms, which are easy if you have decent food and the Protect From Melee prayer. After killing the first 3, just let him defeat you and you'll appear upstairs in Thorvald's house. He'll give you his vote for your bravery. Note: The fourth form is not necessary to kill for this quest, but for those who wish to kill Koschei the Deathless, it is possible. For gear, it is suggested to bring 5 Rings of Recoil, 1 Super Attack, Super Strength and 1 Super Defense potion, as well as around 12 sharks. Basically, after killing the third form, Koschei the Deathless will hit very frequently and fast. It is very difficult to hit him (being level 74 in attack + Super Attack Potion). By using a Ring of Recoil, each damage he deals to you, mainly 1s, will hit him as well. After about 4-5 Ring of Recoils destroyed (don't forget to eat! ), Koschei the Deathless will die and drop a Fremennik Blade. Now just head back to Brundt to become part of the clan, and receive your reward for the quest. He will also give you a Barbarian Name. 2,812 Attack experience 2,812 Defence experience 2,812 Strength experience 2,812 Constitution experience 2,812 Agility experience 2,812 Thieving experience 2,812 Crafting experience 2,812 Fletching experience 2,812 Fishing experience 2,812 Woodcutting experience You can now steal from the Market Stalls and trade with the shop owners. Market Guards and Warriors may now drop Fremennik Shields, regular Helmets, and Blades. You can now board the boat in the northern part of Rellekka. You can have your Lyre enchanted again by offering another Shark - this teleports you to Rellekka when played and has 2 uses before needing re-enchantment. Askeladden will give you another Pet Rock if you speak to him again.